Home Health and Beauty Improve Company Morale! Host A Massage Event! Improve Company Morale! Host A Massage Event! Many corporations are considering massage for group events held in their offices. This technique has been proven to improve productivity and general health. Most people who participate in the events report feeling relieved mentally and physically and also feeling rested and energized. When employees are stress-free, they are less likely to get sick. Since studies show that 70 percent of all illnesses occur when people are under stress, the practice is important to relieve stress and improve employee productivity. These events help to alleviate stress and prevent illness. Why are These Events Recommended? Chair massage is recommended for relieving shoulder tension and neck tension. When people work at their computers, they may often suffer from repetitive motion injury. These events will improve employee satisfaction and boost energy. When the nervous system is calmer, pain will be decreased and flexibility will be improved. Proactive employers are also aware that these events can significantly improve attendance, alertness, speed, and accuracy. Since studies have shown that over 50 percent of lost work days are stress-related and 40 percent of turnover on a job is due to stress, it is imperative to find ways relieve this stress. These events are designed to lower health expenses and visits to primary care physicians. These stress-relieving events are recommended. Choosing an on-site service depends on your goal. Some companies may want to purchase a leather chair massager for under $1,500 and leave it in the office permanently. This can build employee satisfaction daily. Alternatively, chairs may be brought into the office. Some offices prefer to non-electronic chairs with a professional masseuse. Other companies prefer on-site services for employees. The services may cost $70 per hour. Some companies may place time restrictions on the the length of time the services are rendered. Depending on the on-site company, services can last for 10 to 15 minutes if this is preferred by the company. When a client have numerous employees, this may be more feasible for an office. The services can also be accompanied by a confidential health screening. Some companies make this a a regular occurrence. Common time frames include weekly, monthly, or quarterly. This improves employee morale and health. There are several types of chairs, but the most common type is the portable chair that requires a live masseuse to perform the services. Large leather recliner chairs will use technology and electronic mechanisms to massage the back and relive stress. This is important to many companies since over $90 billion is lost each year due to loss in productivity. No company wants to contribute to this figure. Thus, companies should consider contacting businesses to boost productivity within their organizations. When Should Chairs Be Chosen? Choose chairs for employee appreciation days or after a big sales win for the company. Special anniversaries will also demonstrate to the staff that you care about their well-being. Anytime your employees are stressed, plan a group event for your employees. It will be good for your company’s productivity and attendance rates. As a business owner, Jennifer Eden has seen all of the benefits that an office chair massage can have on employees. It is a great way to show how much you appreciate them, and relieve their work stress at the same time! That is why she always trusts Spa-In to deliver the best mobile spa Toronto has to offer! 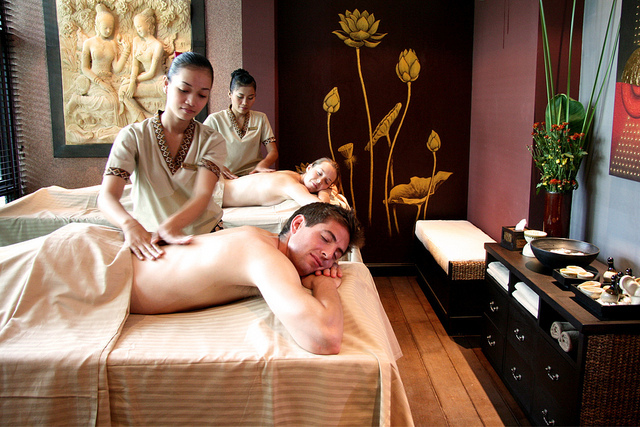 They offer a variety of in home, and office massages and spa parties! To learn more, visit their website today, http://www.spa-in.ca.